Artist and art instructor Rich Theroux works with charcoal during the Rumble House's weekly art battle in Calgary on Wednesday, Feb. 25, 2015. Artists come equipped with their own supplies and have two hours to create a painting before it is auctioned off at the end of the night. 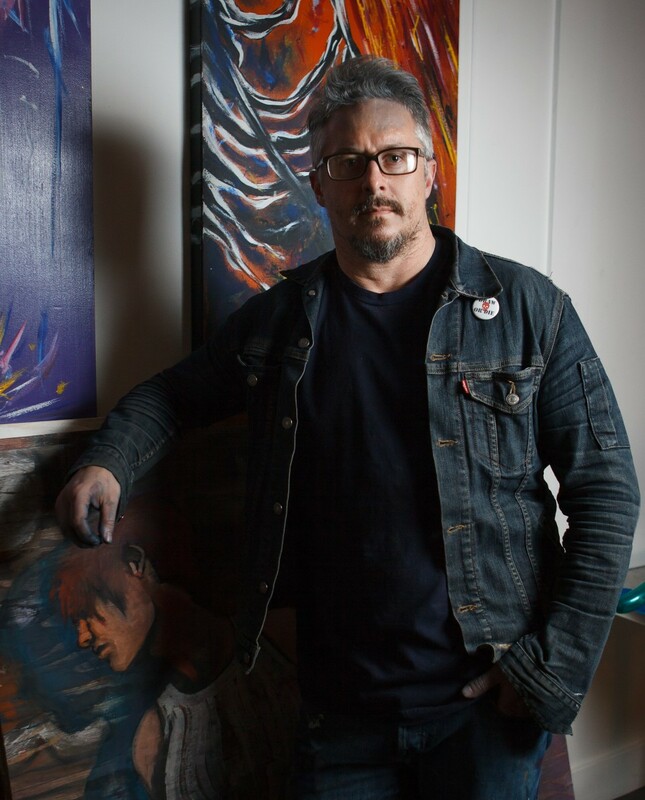 Theroux started Rumble House, a combination gallery, studio, and teaching space. 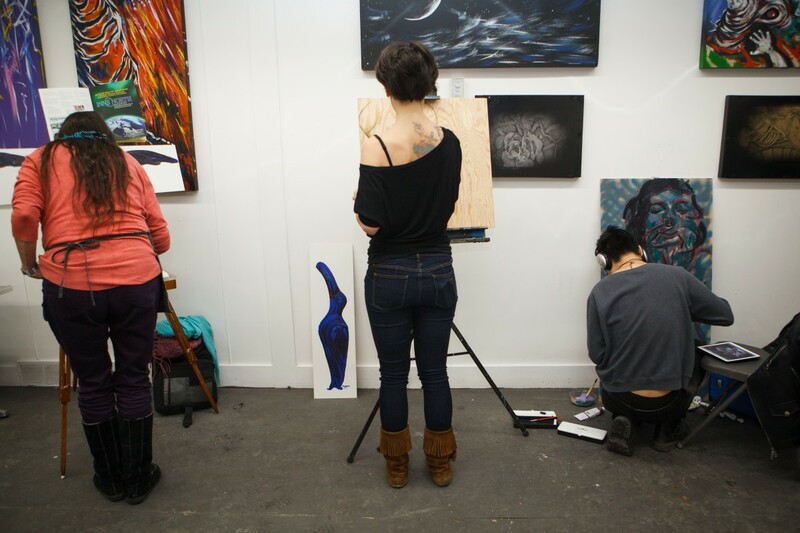 Linda Graham, Jessica Szabo, and Dave Dai paint during the Rumble House's weekly art battle in Calgary on Wednesday, Feb. 25, 2015. Artists come equipped with their own supplies and have two hours to create a painting before it is auctioned off at the end of the night. 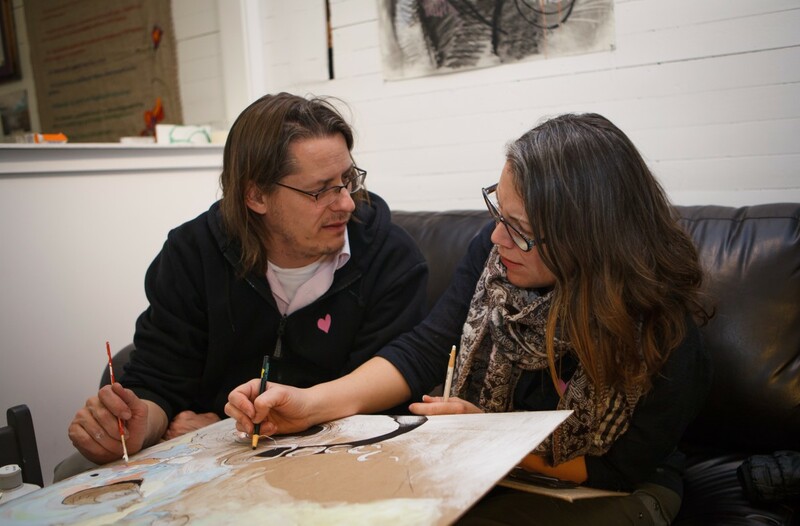 Jeff Watt and Johanna Pelletier paint together and participate in the Rumble House's weekly art battle in Calgary on Wednesday, Feb. 25, 2015. Artists come equipped with their own supplies and have two hours to create a painting before it is auctioned off at the end of the night. 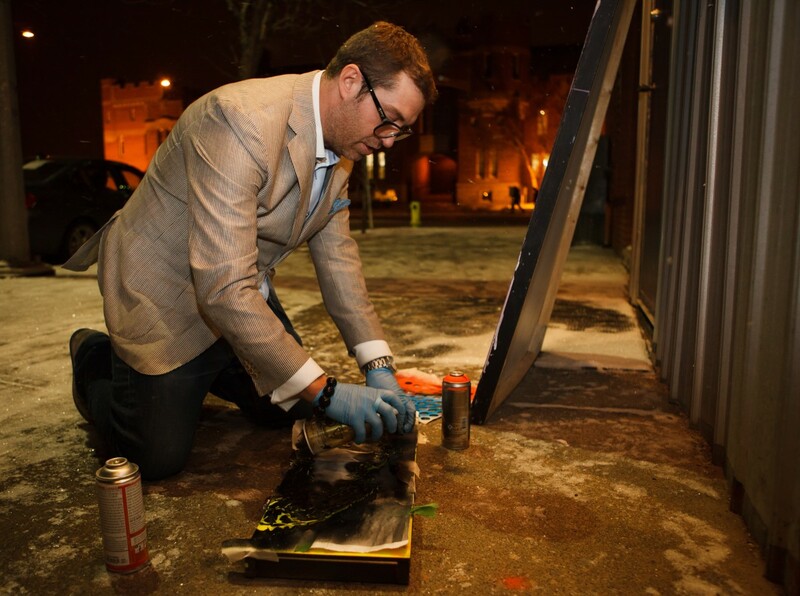 Artist Zach Lowe deals with blowing snow and frigid temperatures while putting the finishing touches on his painting during the Rumble House's weekly art battle in Calgary on Wednesday, Feb. 25, 2015. Lowe started painting 18 months ago but his work hangs in a number of restaurants and businesses around the city. 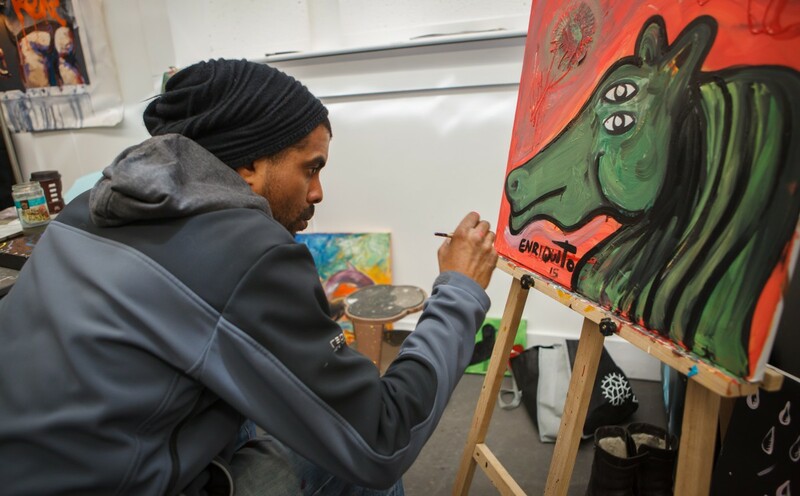 Enriquito Selfismo puts the finishing touches on his painting during the Rumble House's weekly art battle in Calgary on Wednesday, Feb. 25, 2015. Artists come equipped with their own supplies and have two hours to create a painting before it is auctioned off at the end of the night. Selfismo painted a set of three canvases and was able to auction the trio off at the end of the evening. 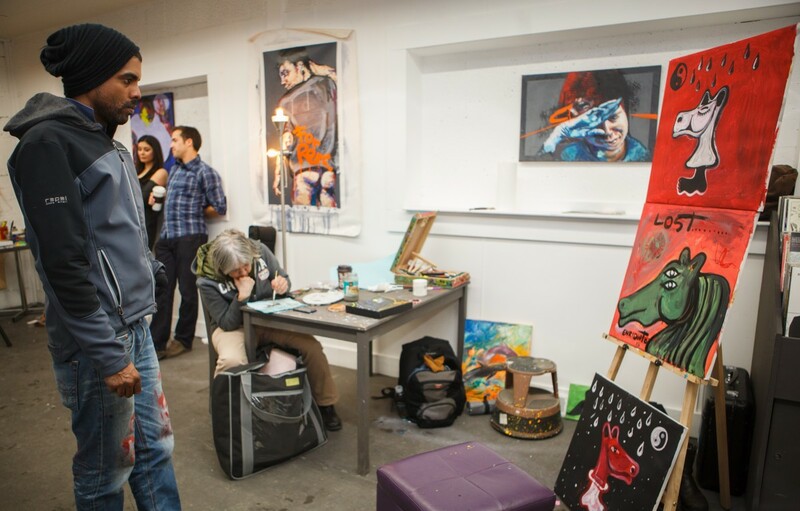 Enriquito Selfismo observes his work following the completion of three paintings during the Rumble House's weekly art battle in Calgary on Wednesday, Feb. 25, 2015. Artists come equipped with their own supplies and have two hours to create a painting before it is auctioned off at the end of the night. Selfismowas able to auction off the set of three at the end of the evening. 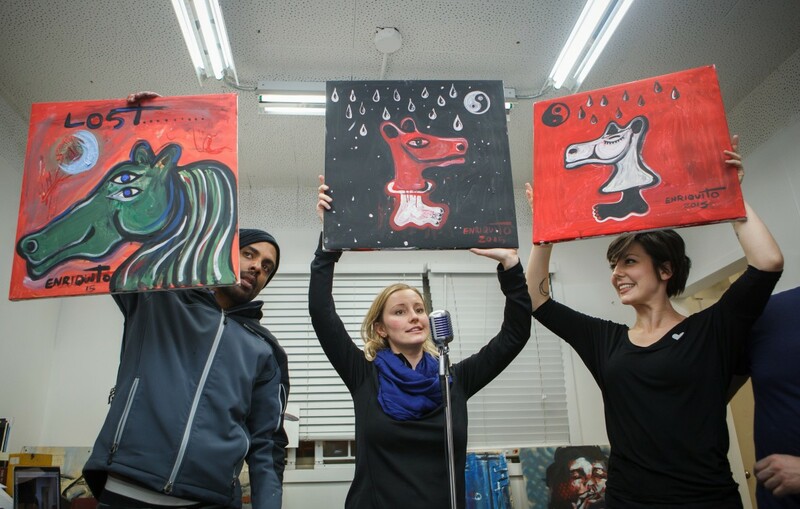 Enriquito Selfismo, Samantha Malach, and Jessica Szabo hold up Selfismo's trio of paintings during the Rumble House's weekly art battle auction in Calgary on Wednesday, Feb. 25, 2015. Artists come equipped with their own supplies and have two hours to create a painting before it is auctioned off at the end of the night. Selfismo was able to auction off the set of three at the end of the evening. 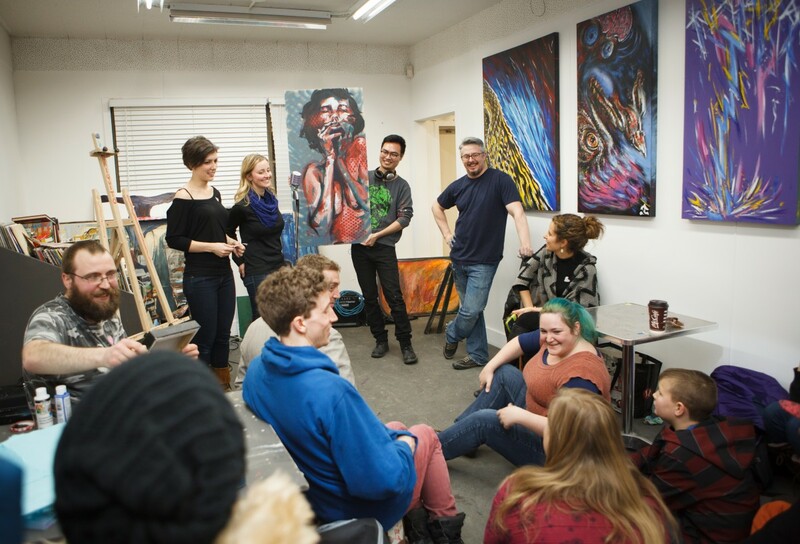 Artists and art enthusiasts bid for Dave "Homeless Babe" Dai's painting during the Rumble House's weekly art battle auction in Calgary on Wednesday, Feb. 25, 2015. Artists come equipped with their own supplies and have two hours to create a painting before it is auctioned off at the end of the night. Dai's painting sold for over$300. 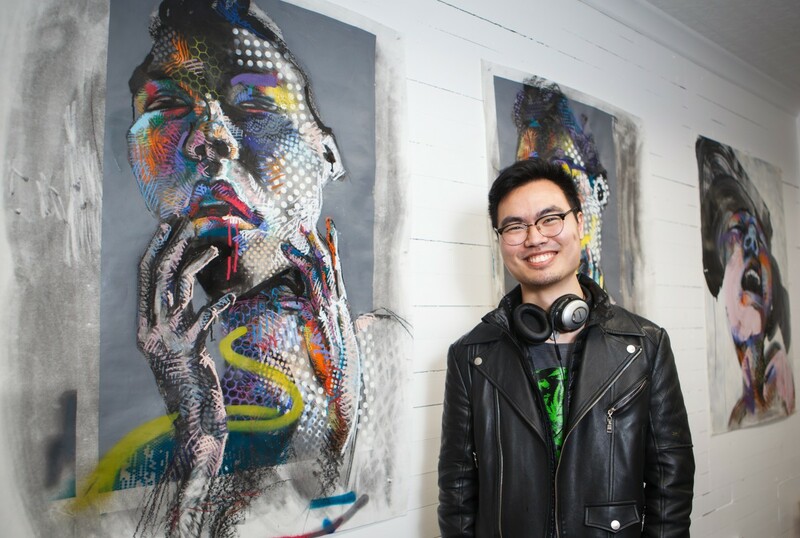 Dave "Homeless Babe" Dai stands next to a series of his paintings at the Rumble House in Calgary on Wednesday, Feb. 25, 2015. 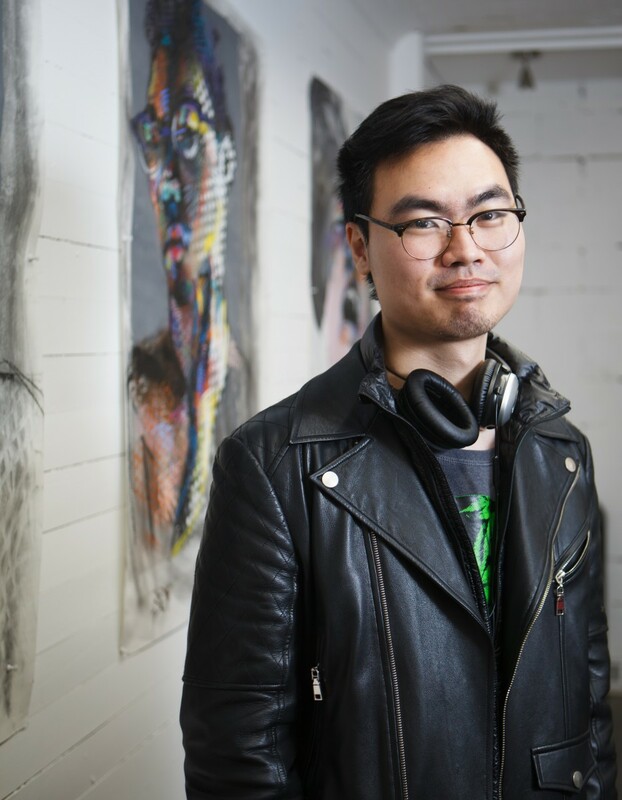 Dai's paintings are currently on display in the combination gallery-studio space in downtown Calgary, which hosts a weekly art battle and auction every Wednesday. 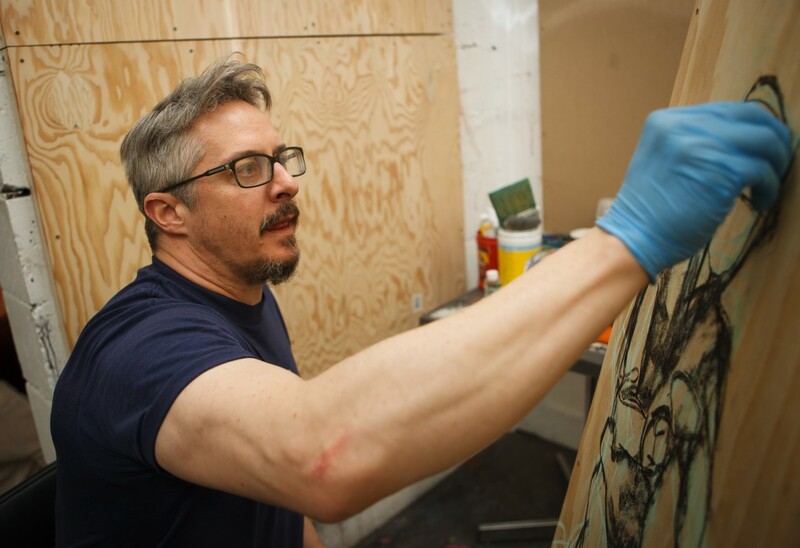 Rich Theroux, artist and founder of the Rumble House, poses for a portrait next to a series of his paintings at the combination gallery-studio space in Calgary on Wednesday, Feb. 25, 2015.